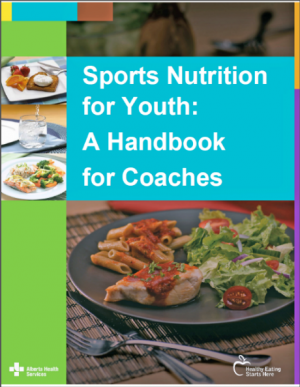 Alberta Health Services has updated their Sports Nutrition for Youth: A Handbook for Coaches! This resource provides sports nutrition recommendations, teaching tools and learning activities for school and community coaches to guide recreational athletes and active youth aged 12 to 18 years. Includes nutrition and hydration advice before, during, and after activity, and information on vegetarian diets, body image, and nutrition supplements. The handbook also outlines ways in which coaches can help athletes create healthier eating environments at home, at school, while traveling and in recreation centres. NEW – Six short modules (includes handouts) that cover key topics like nutrition supplements and what to eat and drink before, during and after activity. You don’t need any technology to teach these discussion-format modules. Deliver sports nutrition information in the dressing room, or on the bench. 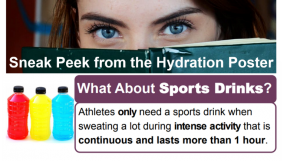 NEW – Four posters that can be showcased in locker rooms, gymnasiums, fitness centres or recreation centres to remind athletes what to drink and eat before, during and after activity. Please share this resource with your networks! You can find the Sports Nutrition for Youth: A Handbook for Coaches online on the Healthy Eating Starts Here website (under Manuals and Toolkits).